Do you know how to crank up the joy and happiness in your life? 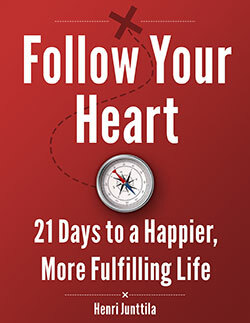 My book Follow Your Heart: 21 Days to a Happier, More Fulfilling life is out now. It’s available exclusively on the Amazon Kindle. But don’t worry, you can read it on any device. You can even read the book in your browser. 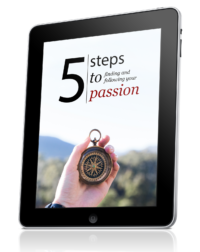 While my last book was all about finding your passion, this book is about living a passionate and happy life. I’ve made more mistakes than most. I’ve struggled, suffered, and scared myself to death. But I don’t regret any of it. All of this struggle has helped me realize what truly makes a difference in life. I’m not immune to problems, but they don’t rock my world as much as they used to. In this book, you’ll learn what I’ve discovered and how I live a heart-based life. And in each chapter, you’ll get three action steps that will help you implement what you’ve learned. As always, I need your help to get reviews on Amazon so this book can reach more people. So once you’ve read the book, and if you like it, remember to leave a review on Amazon, because it really does help. This is extremely important. Leaving a review only takes a few minutes.So remember to leave a review once you’re done, and if you think it’s important for more people to follow their heart and joy. For most, it will be enough to go to Amazon.com. If not, the book is available in Amazon stores around the world. Simply go to the Amazon store in your country and search for my name “Henri Junttila” and you should find it. I hope you enjoy the book, and thanks in advance for helping out! No problem, you don’t need a Kindle device, all you need is a computer, a smartphone or a tablet. It’s as simple as clicking a few links. Reading a book on Amazon Kindle is extremely simple. It doesn’t matter what device you’re on. As long as you’re reading this blog post, you can read the book. For many European countries, Amazon includes a sales tax, which will make the book show up as anywhere between $3 to $6. It’s unfortunate, but that’s how things are right now. If you run into this, or if the book isn’t available in your area, shoot me an email. If you have any questions or problems, drop them in the comments below or email me. As soon as I saw you had I new book, I wanted to get it! However when I open the link to Amazon.com the price is higher. I live in The Netherlands. How can I obtain your book? It seems in some countries (such as Sweden, Finland and the Netherlands) Amazon uses a sales tax that makes books quite a bit more expensive. Shoot me an email and I’ll get you sorted. I like how the book looks, who created your graphics? Graphics created by the fantastic Charlie from CharfishDesign.com. I have a lot of content planned on my whole Kindle experience, but it will most likely not be for a few months. I’m still experimenting and testing things. I live in Australia. Which Amazon store should I go to? I’m not sure to be honest. Try Amazon US. If you can order from there, all is well. Hey Henri, I finally got to read the entire book and wanted to come here and personally (virtually) thank you for it. I got a TON of things out of it and can’t wait to start putting the advice in it to the test, thanks man! Meditation is great once you make it a habit. And remember, you can meditate while running, or doing something else. Just be aware of your body, breath, or whatever fits.